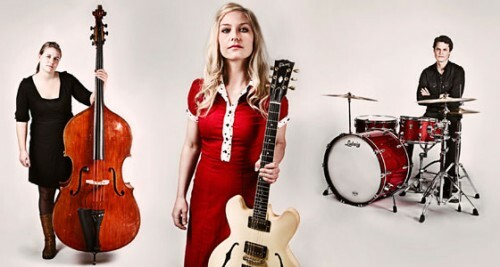 From Norway, improv power rock two third ladies trio Hedvig Mollestad Trio with Ellen Brekken on electric and acoustic bass and Ivar Loe Bjørnstad on the drums, guitarist and leader is Hedvig Mollestad Thomassen, got their debut album "Shoot!" out since September 23rd via Rune Grammofon. The album is completely instrumental apart from the distant shouting in a Melvins cover. "Shoot!" is more song structured than other guitar led trios such as Bushman´s Revenge or Scorch Trio. With the amount of ladies recording albums and performing concerts in Norway, I bet gender equity is just common sense over there. Whatever, ladies and gentlemen, you can stream two tracks from the album below.